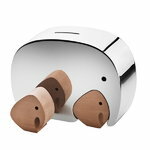 Georg Jensen's Moneyphant with Twins features two small elephants that nest within the larger one. Designed by Alfredo Häberli, the oak-wood baby elephants fit like a puzzle pieces into the original polished stainless steel form. The original Moneyphant was created by Jørgen Møller with the help of his great-grandchild. Møller's first elephant design, a bottle opener, was born in 1987 with the help of his grandchild. As the Elephant became recognized worldwide, Møller then designed more elephants, such as a key ring and the Moneyphant for storing coins. The Moneyphant contains all that Scandinavian design has become known for: elegance, strength and functionality.